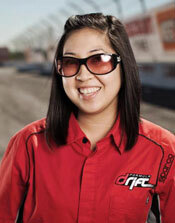 Casidi Tanaka-Fixmer is the manager of ticketing and registration for Formula Drift Holdings in Long Beach, California, and SBN’s Member of the Month. Formula Drift is recognized as North America’s professional drifting championship series. We have seven rounds that travel throughout the United States. We are the first official series in North America that has taken competitive motorsports to the extreme. It is a highly skilled, high-powered motorsport where the drivers maneuver their cars into well executed, controlled sideways slides through a marked course. It is judged on execution and style rather than who finishes the course in the fastest time.